Does your Dad like to geek out with gadgets? Does he have to have everything from the latest in 3dTV technology to an operating system upgrade. So what better gift to give your dad this year than a G-Tech hard drive made by Hitachi GST. On top of all the downloading and uploading Dad likes to do he has probably racked up a whole lot of data on his computer hard drive. G-Tech’s rugged design makes sense for dads who are looking for a sleek and reliable way to store all the digital files they have collected over the years. Sure, tablets and digital cameras might seem more exciting than a hard drive, but don’t you think that your dad’s most important piece of electronics equipment is the one that keeps all those digital pictures of the family and his extensive music collection safe! 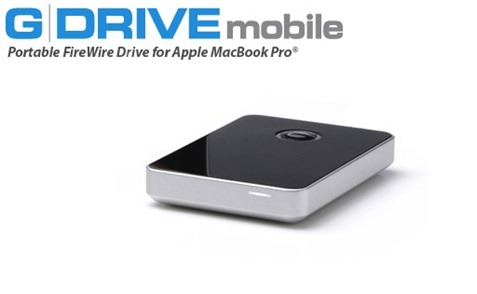 G-DRIVE mobile hard drives are the perfect compliment to your new Apple MacBook Pro®. Weighing in at less than 9 oz., G-DRIVE mobile is the ultra-portable and stylish way to travel with up to 500GB of storage space for your important documents, MP3s, digital video and digital photo files. G-DRIVE mobile is bus powered, eliminating the need to carry an external AC power supply. Portability was never so easy! G-DRIVE mobile is formatted at the factory HFS+ with Journaling and is Time Machine ready right out of the box! A simple initialization is all it takes to prepare G-DRIVE mobile for use with Windows® systems! The G-Drive was super simple to use. I am a new MacBook Pro user, so simplicity is key for me. My old external hard drive had to be plugged into the wall and then into the USB on the computer. 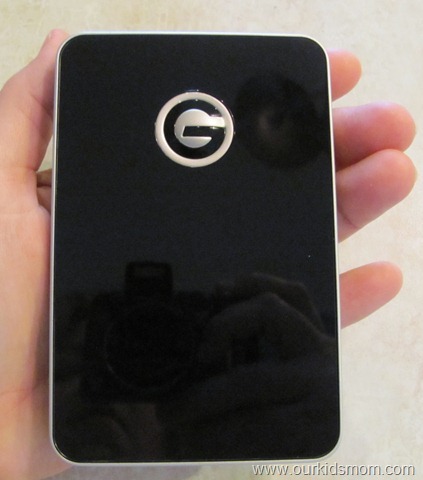 The G-Drive is bus powered… meaning it draws it’s power through the USB. No external power cords, yippee! After unpacking the drive I attached the cord to one end and plugged the USB in. That was it! The G Drive showed up on my desktop, I double clicked and I was in. The G-Drive is so small and sleek compared to my older external, also. They both have a 500 MB capacity, but the G-Drive is half the size and weight making it easier to port around if needed. I am loving all of these features and would recommend this hard drive in a heart beat! ONE OurKidsMom reader is going to win CHOICE of either a G Drive Mobile for MacBook Pro or G Drive Slim for MacBook Air! * Check out G-Technology’s website and tell me something you like, learned or want. This giveaway ends at 11:59PM EST on June 20, 2011. I like G-Tech on fb too! I subscribed to your email…#2! I entered the Hasbro travel game giveaway! I entered the Protect a Bed giveaway! I entered the Munchkin bags giveaway! I entered the Mickey Mouse giveaway. Oh! I want the G-Drive Mini or the G-Drive Mobile! 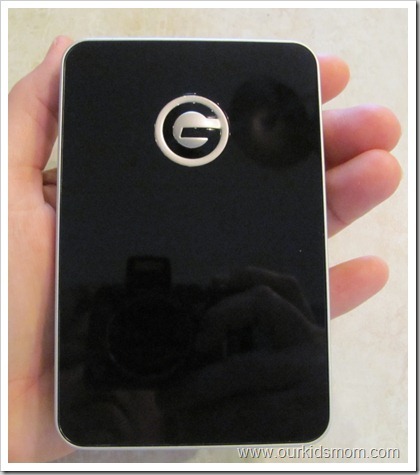 i like the g speed q external hard drive with raid technology! G-Technology, now part of the Hitachi Global Storage Technologies family. Entered your Scotch Brite Bathroom Solutions Line giveaway. Entered your Lysol Spray, Wipes & No Touch dispenser prize pack giveaway. I would also like the G-DRIVE slim drive. It would make a great portable drive to move data between my computers. I learned that Hitachi Gloabl Storage Technology consist of G-Technology. Wow, their website makes me feel very un-techie! I’d love something to store video as I’d like to edit family home videos but wouldn’t know where to start! I’m actually in need of this for my Graphic Design business! I’m a facebook and twitter entry. mini-SAS, and Fibre Channel systems support all levels of audio/video production. G-Tech’s focus on technology, quality and design has resulted in disk storage solutions with unmatched performance, reliability and style. They are based in Southern California. The G-SAFE is an amazing product (Link : http://www.g-technology.com/products/g-safe.cfm) that provides low cost but highly effective safe storage for your pics, documents, video’s, etc. I learned that G-Tech’s mission is to provide the creative community with quality products that incorporate superior industrial design, functionality, usability and performance at affordable prices. I love how small it is. My husban works out of his car, so he has to keep everything in a briefcase. I like how this does both audio and video editing! I want it–for my husband, of course! #2 I’ve got your button on my blog! I never knew there were different devices for storage of different media! I like that this drive is Mac or Windows. they also have a G-Safe if you are really into storage. I like the G Drive Slim. I would like a G-SAFE. I looked around the site and found the G-SPEED Q. My son could really use it. I like that this is compact. Want external hard drive for MacBook. I like G-Technology on FB as Anne Loyd. I entered the Preschool DVD giveaway. I entered the Drop Cam giveaway. I would be interested in the G Safe general storage and backup. They have a number of external hard drives to fit specific needs. I liked G-Technology on facebook. Have not heard of G-technology but they are part of Hitachi global storage which I have heard from and also purchased from in the past ! It’s amazing how much some of these drives can hold! The G-SPEED FC XL is up to 32 TB!! I entered the Stella & Dot Accessories Giveaway! I entered the Lysol Disinfecting Products Giveaway! I entered the Gnomeo & Juliet DVD Giveaway! I learned that you can use multiple computers with the same hard drive. I liked G-Technology on Facebook. THANKS for the AWESOME GIVEAWAY!!! I want the G Speed FC. I entered the sweet treats fudge giveaway. I love the G-Drive mini SSD. I like G-Technology on FB. Los Angeles, in the heart of Southern California. I like the firewire cables. i like their video editing products. I’d love to have the G-RAID mini, sounds great! like you on Facebook (username: Les Cerises). Their storage goes from 320GB up to 24TB! Thanks for the giveaway! I really want the G-SPEED FC XL. It has capacities between 16TB and 24 TB! I entered the Echo Dropcam Wi-Fi Internet Video Camera RV $279 ends 6/24 giveaway. I entered the Linksys giveaway. I learned they have hard drives with capacities all the way up to 24TB, wow! I like G-Technology on facebook. Entered Cisco Linksys E4200 router giveaway…. I like the G-Raid mini for my brother ’cause he’s an editor! What I learned at G-Technology is that I can NEVER have enough disk space! Every time I upgrade hardware there are software upgrades and new files that gobble up that disk space faster than lightning. So, please, award me the xtra 500gb. entered Spongebob Square Pants Heroes of Bikini Bottom GIVEAWAY. I entered the ezShade giveaway. Love the video editing capability! Just starting a home computer repair business, this would be great! I looked and saw the G-Safe, which would be another handy product to have! Pretty easy to use website. I really like the G-Drive Slim. It would be perfect for me going to college in the fall. I had no idea that the external hard drives could be so small and hold all that information. I think I need one for all of the music and pictures that I have on my laptop. I love that G-Tech preserves, manages and stores the unwavering passion of creative professionals, from the simplest backup needs to the most intensive video-editing projects. Find the hard drive that’s right for you! Visited website, and I learned that they have a drive that can store up to 6TB! I entered the Thompson giveaway. I entered the Thompson’s giveaway. entered here twice- disregard this. I like the portability and flexibility of the drive! I entered the Field of Visions giveaway! Thanks for entering me! I entered the Bulldog remote giveaway. I would like the G-Drive mini for photo storage. Entered the Microsoft Office giveaway. I love the G RAID drive — definitely something our church could use! i learned: G-Technology by Hitachi offers premium external storage solutions for professional content creation. Our complete hard drive portfolio delivers unmatched performance, reliability and style designed for Mac users. External hard drives include USB, FireWire, eSATA, mini-SAS, and Fibre Channel systems to support all levels of audio/video production. entered for a chance, thanks. email me if I win! I learned that G-Technology manufactures the most comprehensive line of external disk storage solutions designed for professional content creation applications in the industry. The G SAFE also looks really cool. It actually looks like a safe. Like G Technology on FB as well. I would love to have any of the portable ones. I didn’t know they made 8TB hard drives – wow! I also like the G-RAID Mini Portable High-Performance Dual-Drive Storage System. I like the G-Safe that they offer– It’s USB compatible and can store up to 2TB, which I need for all my photos. I also like the G-SPEED Q hard drive. Subscribed to OurKidsMom by Email. I also like the G-Safe from G-Tech. I am a fan of GTech via Facebook as Jill Myrick. I would like to use the G-Raid mini. I like that they have up to 6tb. That’s a lot of space! Would love the slim one! I know nothing about this stuff, but I like that this device does not require an extra external AC power supply. I live in an old house and sockets can be hard to find plus it is nice to not have another cord. I like the G Speed FCXL storage solutions. I love that they needs portable and desktop models. Also, affordable, high.quality cables. The G-RAID mini looks great! Thanks for the giveaway…would love to have a “G-DRIVE mini SSD” for General Storage / Backup ! I learned that their external hard drives include USB, FireWire, eSATA, mini-SAS, and Fibre Channel systems to support all levels of audio/video production. I’d love to have the G-RAID mini to safely store all my photos. I learned that they also carry a G Drive Slim. That looks nice too.